An extensive survey of continental brick making practice was carried out by Butterworth and Foster in the mid-1950’s and horizontally and vertically perforated bricks were made on a pilot scale in the BRS laboratories. Perforated bricks were not new to the UK. Standard bricks with a proportion of perforation equal to about 15 per cent by volume were being made by a few brickworks. There was little difference in the properties of the bricks in use and the real motive for perforating the bricks was that it helped to overcome manufacturing difficulties which arose in making wirecut bricks from certain clays. It had also been argued that solid bricks were unnecessarily strong and furthermore that the introduction of voids improved their poor thermal performance. Much effort was made into developing patterns of new bricks which gave the optimum in thermal insulation and strength while still enabling the building of walls which resisted driving rain. Two kinds of perforation were tried, horizontally perforated (H) bricks and vertically perforated (V) bricks. Both had their merits but vertically perforated were considered more promising. Several patterns were developed with the final version providing a brick, including the mortar joint, to a module of 9 in. x 9 in. x 3 in. (Figure 2). Thus the external appearance was the same as a solid brick wall. It was equal to two standard bricks in volume though by reason of its perforation weighed only slightly more than a single brick of the same clay. The V brick had an average weight of 8 lb 11 oz. with a standard brick of the same clay weighing 7 lb 2 oz. 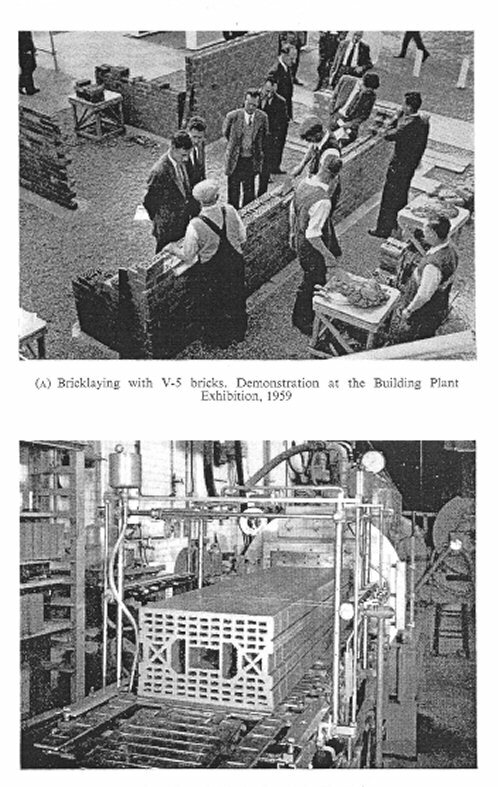 During the development period, BRS V bricks were demonstrated at exhibitions (Figure 3) and used to construct a considerable number of buildings including flats, houses and schools. A variety of bonding and other problems arose in these buildings and solutions were developed. Manufacturing was taken up by brickmakers with one plant due to start producing in 1962 and a second shortly after. The need to improve thermal insulation of walls led to the introduction of lightweight insulating blocks and their use in a facing brick/cavity/insulating block wall became almost universal. The V brick could not offer these benefits and faded from the scene.